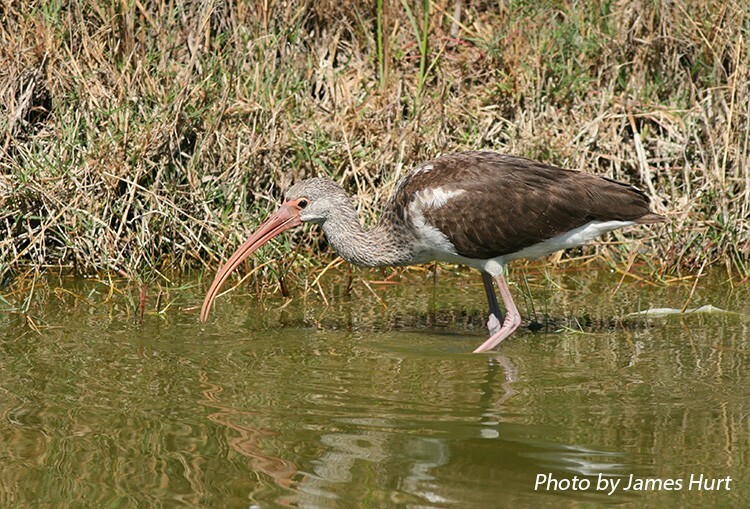 White Ibis are rare but regular visitors to Tennessee in late summer and early fall. Primarily immature plumage birds are found, rarely adults. It is almost always found feeding and roosting with other herons. The breeding range extends along the Atlantic Coast from North Carolina southward, along the Gulf Coast to Mexico, throughout the Caribbean, and there is a small population in South America. It winters over most of this range, as well as farther inland. Egrets are all white, but have straight bills and lack black wingtips. Wood Storks are much larger, have a dark gray bare-skin face, a heavy gray bill, and more extensive black in the wings. Habitat: In Tennessee, found in shallow marshes, pools and swamps. Diet: Aquatic crustaceans and insects. 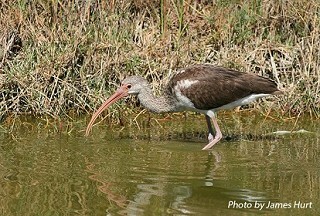 Status in Tennessee: The White Ibis is a rare but regular visitor to Tennessee. Most records are from early July through mid-October. The majority are from West Tennessee, but it has been recorded across the state. Most foraging, especially when in standing water or soft mud, is done by feeling the prey, without seeing it. Bill tips appear to be very sensitive, and contact with prey probably elicits a reflex closing action. Best places to see in Tennessee: Immature birds are rare but regular visitors to shallow marshes, pools and swamps across the state, in late summer and early fall. Kushlan, J. A. and K. L. Bildstein. 1992. White Ibis (Eudocimus albus). The Birds of North America, No. 9 (A. Poole, P. Stettenheim, and F. Gill, Eds.). Philadelphia: The Academy of Natural Sciences, Philadelphia.